Apologies.....I've a wedding to cover for (grandma duty) and domestic engineering/daughter duties to attend to, so unfortunately Oatlands Handmade doors will be closed from this Friday 11th for a week.....OPEN BRIGHT & SHINING SUNDAY 20th November........and I think our talented maker Wendy Koolhof is coming to play Sunday 20th and Monday 21st. This week has been really busy (I opened extra days) as many wonderful people are touring after having visited Deloraine and Latrobe Craft Fairs, inlcuding 9 lovely ladies from Newcastle and the Hunter Valley yesterday, and three lots of multiple sisters travelling together over the past week! ...earlier this week, a great group hosted by Maree from Overseas Adventure Tours rocked in! 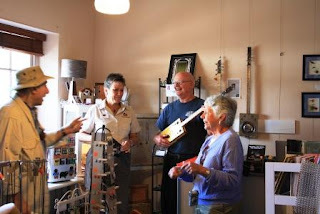 These friendly seniors from the States had a good browse in the shop and some even tried out our Devil Guitars Tasmania Tassie Devil CGBs. A sing-a-long followed!! 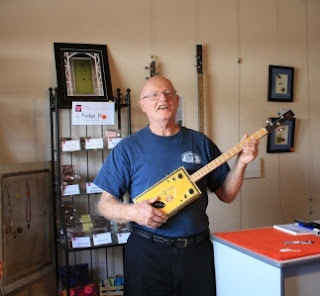 Four new Tassie Devil Cigar Box Guitars (were) in stock (...now there are 3!). 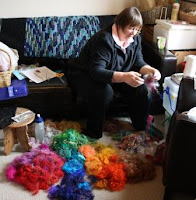 Isn't it lovely when friends come to help: the lovely Sue Evans from I Love Felt Fibre & Fashion dropped by yesterday and spent hours in the back room sorting out silk fibre for me. THANKS SUE !!! We also now have in stock, an extended range of embellishing and embroidery threads from Mahdi Chandler and Oatlands Handmade's very own range of Tasmanian Superfine Wool 2ply hand dyed embroidery/fine tapestry thread in 10 good strong colours. Also available, undyed 6 strand silk, spun silk and very fine wool/silk, all in 8 metre hanks. I'll put them in the On-Line Shop as soon as I can. 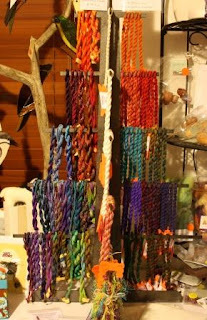 Our new Thread Tree, from Deepblue Designs, Evandale. Thanks Tina!